Are You Overlooking Any (or All) of These 7 Ways to Build Online Authority with LinkedIn? People are attracted to these spectacles. We drop what we’re doing and gather around to watch, but then we leave. We go back to what we were doing before we were interrupted. No one really knows who orchestrated the performance. The entire experience is short-lived and doesn’t make any profound impact. 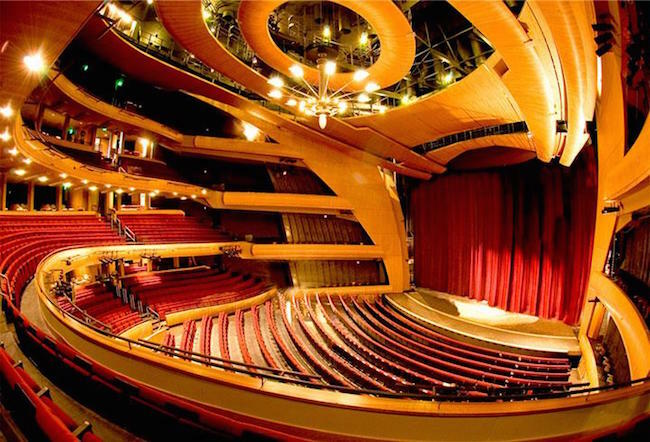 Now, imagine performing at an opera house, such as the Ellie Caulkins Opera House pictured above — the venue for Authority Rainmaker 2015. An attentive audience becomes fascinated by your performance and applauds you to show their appreciation. You know they’ll be back for more. You can have that same type of interaction with your audience on LinkedIn when you properly position yourself on the platform. While some may think of LinkedIn as only a job search or recruitment portal, it is evolving into a lead generation and publishing hub for content marketers. Content pages on LinkedIn receive seven times more views and have six times more engagement than job-related activities. And since Pulse and SlideShare are part of the LinkedIn ecosystem, it’s an ideal center for professional content sharing. This is the LinkedIn Opera House, and you have an opportunity to take the content stage. Here are seven ways to help you build authority on LinkedIn. Get stage-ready for your performance. Sloppiness won’t cut it. You can’t command attention or earn trust if your LinkedIn profile is incomplete. It needs to thoroughly represent you and display a professional-quality headshot. Unless you’re participating in a masquerade ball, you won’t perform behind a mask. Other users will check out your profile when they see your comments and posts. They’ll want to discover who you are and the solutions you offer. Engage your audience with strong headlines and sharp copywriting. Business professionals invest time in consuming content on LinkedIn, so prepare and rehearse your work. LinkedIn offers a media-rich platform, but you’ll still need to write the script, choreograph the movements, and perform to your audience. Don’t worry if every topic you want to discuss has been covered already. Most fans don’t mind having different versions of the same music performed by different artists. Different conductors interpret the pieces differently and musicians play with subtle nuances and delivery styles. Some artists add variations to the theme and change the arrangement to evoke something innovative and fresh. Just make sure that you offer a unique angle with your own interpretation and insight. Using different media formats, such as infographics, can also inject a breath of freshness into your content. Join an existing performance troupe that already has an audience. LinkedIn has 2.1 million industry and interest-specific groups. Like-minded people gather around topical discussions on LinkedIn, and you just need to search for niche groups with active discussions to locate your target audience. And there’s room for you to shine because the LinkedIn content stage is not too crowded yet. Currently, you can join up to 50 LinkedIn groups, and there are benefits to joining multiple groups because LinkedIn searches are personalized. For example, although you may not have a first-level connection with a certain contact, if you both are members of the same discussion groups, you become more closely connected on LinkedIn. And people who are directly connected to you — as well as those in the same groups as you — are more likely to show up in searches performed on LinkedIn. You don’t own LinkedIn’s content stage, and there are others who share the stage with you. Band members harmonize with each other. Even soloists work closely with stage managers, crews, and other musicians. In every group, you’ll find a few members who consistently add value to the discussions. These are your potential joint venture partners. Reach out and connect one-on-one to explore collaborative opportunities and form deeper relationships. If you’re both members of the same group, you can send private messages to connect without using “InMails” or “introductions” — even if you don’t know them personally. Presenters, trainers, and coaches don’t speak to the masses; they make eye contact and speak to individuals. Fortunately, LinkedIn offers features that allow personalized communication when you send invitations from your computer or mobile device. Notes, reminders, and tags facilitate personalized conversations and are helpful for follow-up conversations. Your work is not done at the end of the show. Performers hold review sessions after their shows and consider how they can adapt to the audience’s preferences because they want to improve and sell more tickets to the next show. Feedback from your audience may come in the form of engagement — or lack of engagement. On LinkedIn, monitor responses to posts and listen to comments. Also, observe influencers, subscribe to industry channels, and continuously find ways to add value. Strive to become a resource for other users. You don’t become a superstar after one brilliant performance. Broadway shows run for months. Performers build their reputations over time. To build a trustworthy brand name, you’ll need to consistently produce and stage great shows so you stay at the top of the chart. However, discussions in open groups and long-form posts published on LinkedIn are indexed, so they may surface on LinkedIn searches, as well as Google searches. Your efforts are not wasted. Every thoughtful post and comment has been recorded and they may still bring you viewers at a later time. Anyone who searches for a topic on Google may see a relevant LinkedIn group discussion in the search results. If they click on the discussion link, they’ll be able to see the person who initiated the post — even if they’re not logged into LinkedIn. If they scroll through the discussion thread, they’ll also see the entire conversation, including your comments if you’ve contributed to the conversation. It is also worth noting that participating in a LinkedIn group discussion provides you with more visibility. Distracting advertisements and sponsored posts on the homepage can push your individual posts downstream if there is little or no engagement with them. Comments you make in LinkedIn groups, however, will appear in both the discussion groups, as well as on homepage streams. In addition, LinkedIn will send emails with your comment to members who’ve contributed to the discussion thread (unless they choose not to receive these messages). As you enter the spotlight on LinkedIn, remember to abide by a group’s rules when posting. Once a post has been blocked and deleted in a group, comments you make in the group, and possibly other groups as well, will be marked for moderation. All set? Ready to make LinkedIn a part of your content marketing? How do you aim to add value and stand out on LinkedIn? Editor’s note: If you found this post useful, make sure to check out Sean Jackson’s article, 16 Smarter Ways to Use LinkedIn to Build Your Business. Louisa Chan is a marketing coach and content trainer. She conducts workshops to help businesses use new media effectively. Get her free LinkedIn eGuide to enhance your professional online presence and attract more ideal clients.